Save 15% with this coupon. Enter code CUK9GJC4 at checkout. 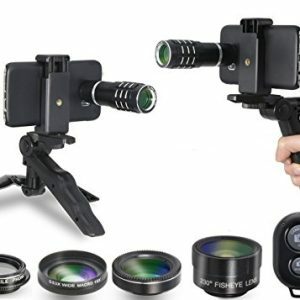 12X ZOOM TELEPHOTO LENS overcomes the short coming of camera cell phone that can only near-sighted.Adjust the focal length by turning the lens. 0.45X WIDE LENS: Wide angle lens will increase about 49% view range to take picture of large ranges for group of people, buildings and landscape. 15X MACRO LENS: keep the lens close to the one to photopraphy, having a more precise and clearer picture. Note: The macro and wide angle lenses are screwed together, used as wide lens. If you want to use the Macro one, just twist them and remove the wide lens. MY MIRACLE is a professional manufacturer of Photography, Excellent Design & Manufacturing Team and strict Quality Control procedures would bring you the best product. especially in mobile phone camera lens.Sophisticated equipment, professional services, is the perfect guarantee of quality. Camera Lens Materials: Aluminum alloy and optical glasses. In the telephoto lens use, because the jitter will make the picture becomes blurred, so when using it, it is recommended to use the tripod fixed, and then use the remote controller to shoot. 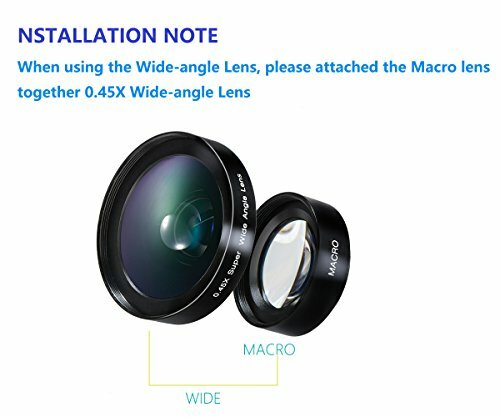 The Macro Lens and the Wide Angle Lens are attached together while you receive them. If you want to use the Wide Angle Lens, screw the two lens together to take wonderful pictures. If you want to use the Macro Lens, remove the Wide Angle Lens first. 50 days money-back and 15-month worry-free Guarantee! 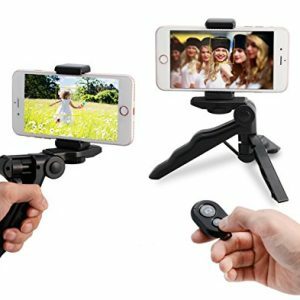 CELL PHONE TRIPOD – A high end mini multi-functional tripod can be used for as cell phone tripod, camera tripod and all cell phone tripod stands . Shoot still and movies. Use portable travel mini tripod and pistol grip stabilizer. Universal cell phone tripod mount adapter. Compact, lightweight and durable. BLUETOOTH WIRELESS REMOTE CONTROL: With free shutter control. Fits as a Iphone remote control an all cell phone remote control. Perfect for taking selfies and steady tripod shots. Simple & easy to set up. Long distance use. 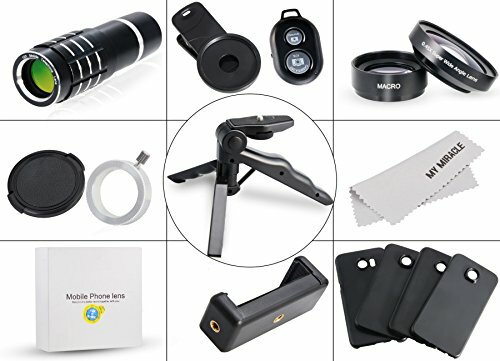 POWERFUL MOBILE PHONE LENS KIT SATISFY YOUR PHOTOGRAPHY NEEDS – 12X Telephoto, 2in1 Wide Angle & Marco Lens, 17mm CPL, 230° Fisheye Lens. 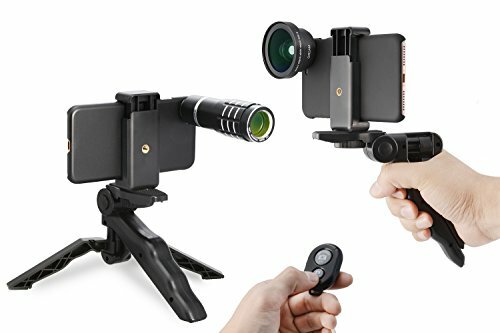 And the Accessories – Multifunctional Mini Tripod, Universal Clip & phone holder, Bluetooth Remote Control, Micrfiber Cleaning Cloth, 4 Pcs Hard Case for iPhone 6 (6s) / 6 plus(6s plus) / 7(8) / 7 plus (8 plus). Turn your phone into DSLR Camera Easily. 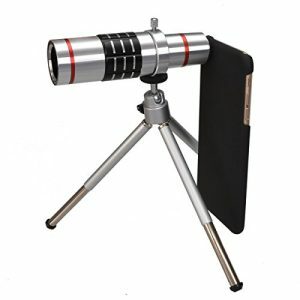 5IN1 MOBILE PHONE LENS KIT FUNCTION INTRODUCTION, 12X telescope can take clear pictures of a long distance, 0.63X Wide angle lens can capture a wider range of photos, 15X macro lens can shoot more small items, 198? ?Fisheye lens can shoot a visual contrast photos. (17mm CPL)Polarizer can reduce the impact of non metallic surface reflection. Wide range of uses: It links to cellphone to take photos and videos to meet most customers when travelling. It is also used for bird watching, watching wildlife or scenery, watching sport games , music concert and so on. 4 MOBILE PHONE CASE designed specifically for the Samsung GalaxyS6/S6Edge/S7/S7Edge, so that the lens when shooting more stable. The addition of a Universal clip, can be used for other models of mobile phones. 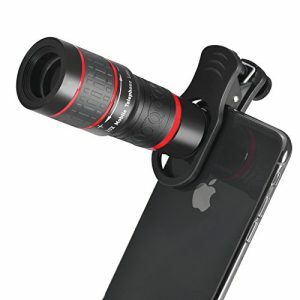 12X ZOOM TELEPHOTO LENS overcomes the short coming of camera cell phone that can only near-sighted.Adjust the focal length by turning the lens. 0.45X WIDE LENS: Wide angle lens will increase about 49% view range to take picture of large ranges for group of people, buildings and landscape. 15X MACRO LENS: keep the lens close to the one to photopraphy, having a more precise and clearer picture. 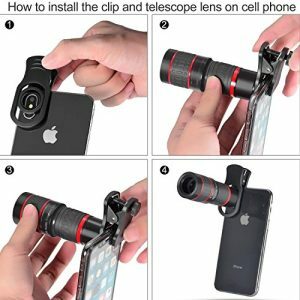 Professional Design : 2 in 1 Cell Phone Lens Kit,Wide-angle lens gives you a major wide view and the macro lens gives you a magnified picture.Anywhere you can imagine. It can be easily clipped on your jeans or hanged on your backpack. 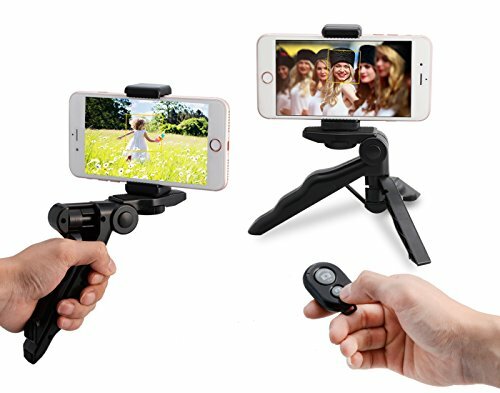 CELL PHONE TRIPOD – A high end mini multi-functional tripod can be used for as Iphone tripod, camera tripod and all cell phone tripod stands . Shoot still and movies. Use portable travel mini tripod and pistol grip stabilizer. Universal cell phone tripod mount adapter. Compact, lightweight and durable. Light and Easy to Operate – Because of the plastic shell, the overall weight will be very light, so that when you install it, it will not make your phone feel heavy, so that the operation is more relaxed. Adjustable 20X Telephoto Lens – Make distant view for you at the moment. Can be used as a binocular separately. The black case snaps onto your phone is for careful protection. 20x Telephoto lens overcomes the shortage of cellphone that can only take photos in short distance. 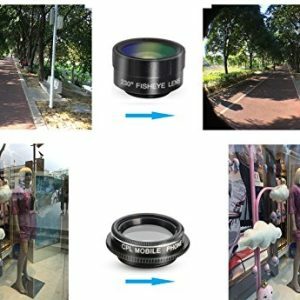 The smartphone telephoto lens is also a Telephoto Monocular Lens with eyecup: Never miss any remarkable and unforgettable scene. This removable clip-on camera lens can also be used as a standalone telescopic lens to help you view distant objects, sceneries, games and concerts more clearly. 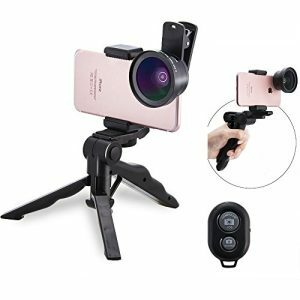 POWERFUL MOBILE PHONE LENS KIT SATISFY YOUR PHOTOGRAPHY NEEDS – 12X Telephoto, 2in1 Wide Angle & Marco Lens, 17mm CPL, 230 Fisheye Lens. 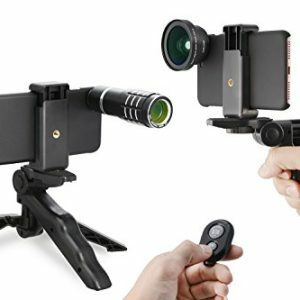 And the Accessories – Multifunctional Mini Tripod, Universal Clip & phone holder, Bluetooth Remote Control, Micrfiber Cleaning Cloth, 4 Pcs Hard Case for Samsung Galaxy S6 / S6 Edge / S7 / S7 Edge. Turn your phone into DSLR Camera Easily. 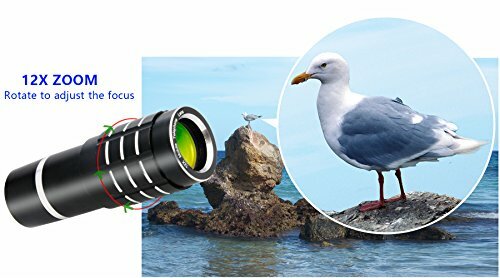 [20X TELEPHOTO LENS] It can catch targeted fay-away object, which magnifies the view by 20times for you. It is a good choice to watch football, baseball, basketball, etc. It is also used for watching bird, wildlife and scenery without distortion. Fish Eye Lens: 230° Fisheye Lens for 3D spherical pictures. [WIDE ANGLE] The 0.6x wide angle increase your wide-angle range, such group of people, buildings and landscape. 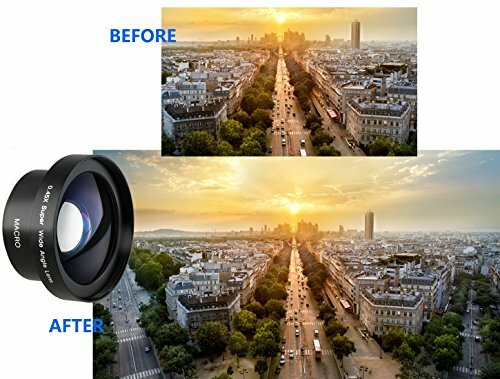 Give you a high definition wide angle image without distortion. 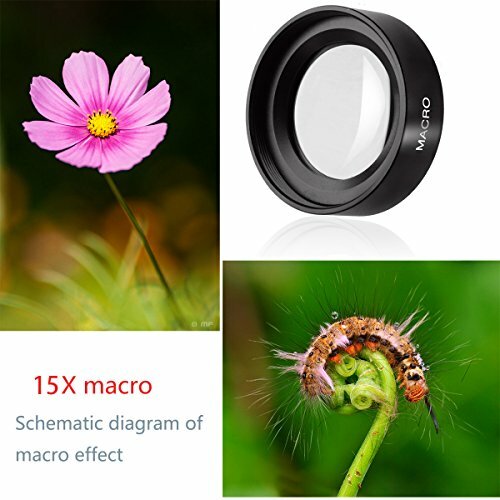 15X MACRO: Macro lens is a kind of special lens for people to take photos of Very small objects, such as flowers, insects, etc .The distance between you and the target should be 3-5centimeters.